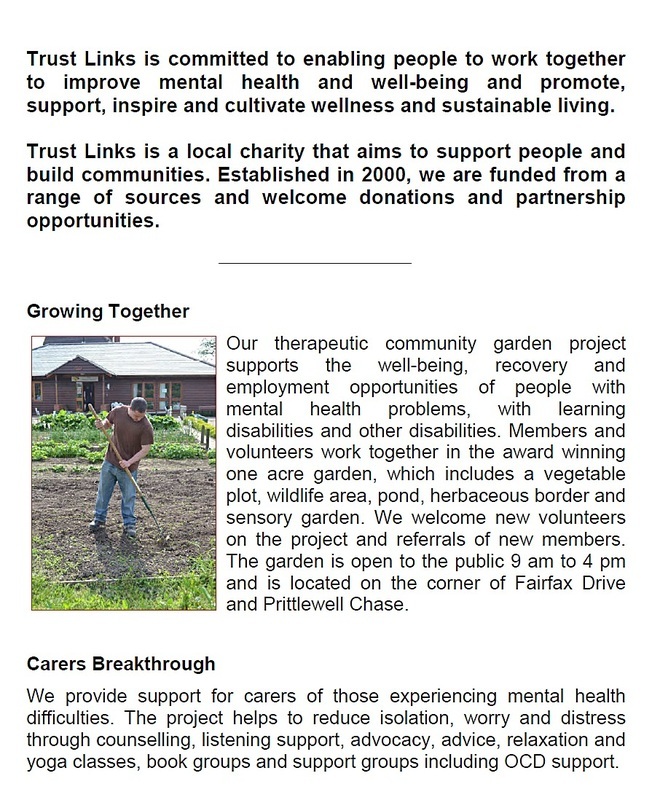 Our therapeutic community garden project supports the wellbeing, recovery and employment opportunities of people experiencing mental health problems, with learning disabilities and other disabilities. Members and volunteers work together in the award winning garden, which includes a vegetable plot, wildlife area, herbaceous border and sensory garden. Launched in 2013 and funded by the Big Lottery Fund, the project is transforminga disused one acre allotment site on Elm Road into a beautiful community resource. The garden will include a log cabin, wildlife pond and raised vegetable beds. We aim to provide a caring structured environment where people with mental health problems can participate in activities to build confidence and skills. We provide support for carers of those experiencing mental health difficulties, helping to reduce isolation, worry and distress through counselling, listening support, advocacy, advice, relaxation and yoga classes, book group and support groups including OCD support. Our Schools Programmes at Westcliff and Shoeburyness provide vocational activities for children disengaged from mainstream education. Our straw-bale building at Growing Together Westcliff has photovoltaic and solar hot water panels. The garden and sales area is open 9am to 4pm weekdays, selling plants, organically grown fruit and veg and local honey. We provide vocational training and our meeting rooms are available for hire. We manage an historic orchard near Southend Airport on behalf of Southend Council. This site is very tranquil and is able to offer a quiet and peaceful environment, and an abundant harvest of traditional apples, pears and plums. We work in close partnership with other local organisations to develop strong and resilient communities. We run community events, provide volunteering opportunities, advocacy, skills development and support to improve the quality of life for people locally.